Designed for precise recovery with minimal trauma. Available with single lumen system with a choice of needle sizes: 33cm 16 or 17 gauge stainless steel needles. Triple ground tip for optimal sharpness without coring. Echo marking maximizes ultrasound visibility. 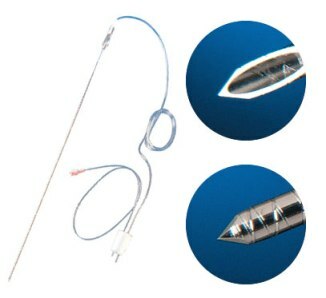 The Oocyte Recovery set incorporates needle and tubing supplied ready assembled without Y connector. *Soft, biocompatible polymers to minimize trauma to oocytes. *Echo marking extends to the needle tip which enhance ultrasound visibility. *Supplied with 950mm of tubing and expanded internal diameter of aspiration tubing to allow passage of extracted oocytes. Direct connection between aspiration tubing and needle ensures smooth transition and removes any possible oocyte trap.